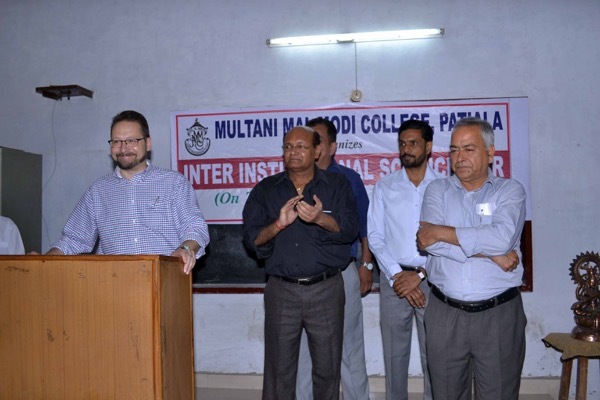 Inter Institutional Science Fair was held at Multani Mal Modi College on the eve of Modi Jayanti on 24th October, 2015. A competition was held for Static Models, Working Models and Poster Presentation on the theme ‘Science and Society’. Around 270 students from 20 schools and 7 colleges participated in the Science fair. Dr. Khushvinder Kumar, Principal welcomed the Chief Guest, Judges and teachers of various competing institutes. Dr. Vinay Jain, Dean Sciences spoke on the theme i.e. Role of Man in Recent Disasters. Chief Guest O. P. Jasuja, Dean, Physical Sciences, Punjabi University, Patiala appreciated the organisers and the participants for this endeavour. He further said that such events encourage scientific temper among the students. Prof. Symon, Dept. of Forensic Science Turtil University Perth, Australia was the Guest of Honour. He appreciated the enthusiasm zeal and fabrication skills of participants. The College Principal Dr. Khushvinder Kumar welcomed the teachers and the participants. He informed that the college is maintaining a healthy tradition of organising this event regularly since many years. In Poster Presentation, Ridhi and Rashpaul of DAV Public School, Patiala got 1st position, Sophia of Paradise International School, Patiala bagged 2nd position and Bhavnoor Kaur and Navrooj Kaur of Guru Nanak Foundation Public School, Patiala and Gagandeep and Manpreet Kaur of S.S.R. School for Meritorious Students, Patiala got 3rd position. In Static Model Category, Ramdayal Singh and Sarabjeet Kaur of Senior Secondary Residential School for Meritorious Students, Patiala bagged 1st position, Prerna, Priyanshi, Hashima and Amandeep Kaur of Shivalik Public School, Patiala got 2nd position and Samardeep Singh and Dhruv Kalra of Budha Dal Public School, Patiala and Manav and Jayati of D.A.V. Public School, Patiala got 3rd position. In Working Model Category, Sanjampreet Singh, Harsh Mittal, Rishab Mittal and Bharat Mittal of Bhupindra International Public School, Patiala bagged 1st position, Rajveer Kaur and Sandeep Kaur of S. S. R. School for Meritorious Students, Patiala got 2nd position and Manas Mehndirata and Jatinder Kumar of Dayanand Public School, Patiala and Nitika Garg, Neelam Kaur and Prince of The Paradise International School, Patiala got 3rd position. In Poster Presentation, Gurleen Kaur and Manminder Kaur of Govt. Mohindra College, Patiala bagged 1st position, Arshpreet Kaur and Pahul of Multani Mal Modi College, Patiala got 2nd position and Kuldeep Kaur and Simarpreet Kaur of Multani Mal Modi College, Patiala and Ramandeep Kaur of Govt. College of Education, Patiala got 3rd position. In Static Model Category, Vikram and Mandeep of Govt. 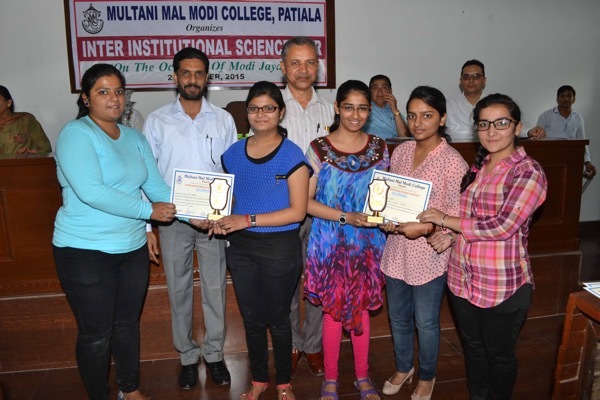 Mohindra College, Patiala got 1st position, Rubi Singla, Ravesh Mittal and Kawalpreet Kaur of Multani Mal Modi College, Patiala bagged 2nd position and Harmanbeer Kaur and Neha of Khalsa College, Patiala got 3rd position. 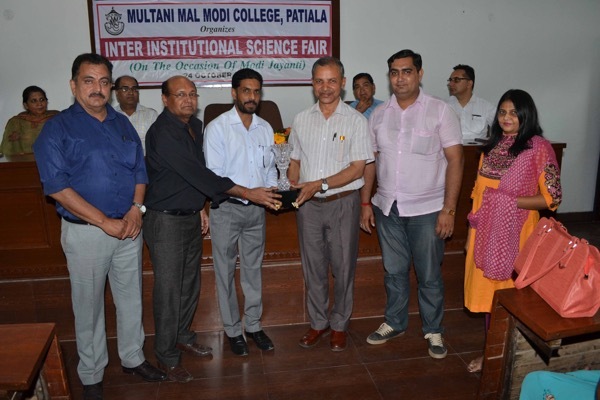 In Working Model Category, Abhinandan and Solvie Garg of Multani Mal Modi College, Patiala got 1st position, Rohit and Deepak of Multani Mal Modi College, Patiala got 2nd position and Yukti, Meghali, Srishti, Venika and Manpreet of Multani Mal Modi College, Patiala got 3rd position. Dr. Vinay Jain, Convener of the event said that such competitions are need of the hour as our society is facing environmental challenges these days. An essay writing contest was also organised on this occasion. In the English writing category Pahul P K Sandhu got 1stposition while Jay Kaushik and Anupreet Kaur got 2nd and 3rd position. In the Punjabi Essay writing category Gagandeep Singh bagged 1st position Parminder Kaur got 2nd and Bhupinder Singh was at 3rd place. In the Hindi category Ruchika Dev got 1stposition, Gaurav Singla got 2nd and Anu Rani was placed at 3rd. Hawan Yajna was performed in the college campus. Prof. Surindra Lal and Col (Retd.) Karminder Singh, members of the College Management, and retired staff members were also present on this occasion. The valedictory session of the Science Fair was presided over by Dr. N. S. Attri, Additional Dean, Research, Punjabi University, Patiala. The College Principal and Dr. Attri felicitated the winner teams and the individuals with prizes and certificates. Dr. Kamaldeep Paul, Dr. M. K. Sharma and Prof. M. L. Malhotra were the judges for the college category competitions while Dr. Manjit Singh Saini, Dr. Neena Singla and Dr. Kawaljit Singh performed as judges for the school category presentations. Dr. Rajeev Sharma conducted the stage. Dr. Ashwani Sharma co-ordinator of the event presented the vote of thanks. Dr. Meenu and her team worked tirelessly for the success of the event. 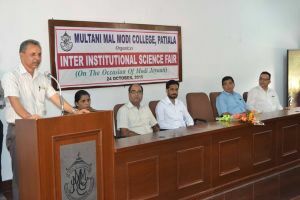 Chief Guest Prof. O. P. Jasuja, Dean, Physical Science, Punjabi University, Patiala and Guest of Honour Prof. Symon, Dept. of Forensic Science Turtil University Perth, Australia inaugurating the Science Fair.